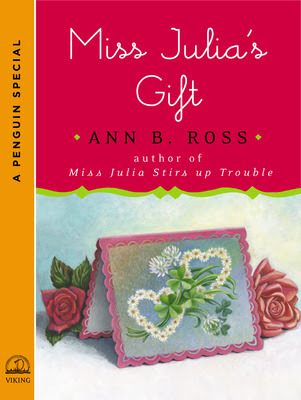 Featuring the beloved stars of the Miss Julia novels—Luanne, Lillian, Hazel Marie, and of course, Miss Julia herself—Miss Julia's Gift is a funny and moving meditation on love, marriage, and the purpose of gift-giving. Miss Julia finds herself reminiscing about her first year of marriage to Sam Murdoch. Everything seemed perfect—alarmingly so. Miss Julia feared that Sam would morph from a sweet and loveable man into a replica of her loathsome first husband, the boring and deceitful Wesley Lloyd Springer. Even Sam's adorable habit of giving her gifts for all holidays and occasions—no matter how minor—caused Miss Julia anxiety. When will the other shoe drop, she wondered? After some soul-searching and valuable advice from her friends, Miss Julia comes to understand that Sam is nothing like Wesley—and never will be. Then, just in time for Valentine's Day, she thinks up the perfect romantic gift for her husband and realizes which gift she values most of all. Miss Julia has seen her fair share of drama and adventure. Just a few weeks after her first husband's death she learns that he had a mistress and child out-of-wedlock. She then stuns her friends and neighbors by taking the mistress and child into her home and under her wing. Her ex-husband didn't exactly provide her with a glowing example of what a husband should be. Now she's in her second marriage and although she dearly loves her new husband, Sam Murdoch, she isn't quite sure what to do about his spontaneous gift giving. Miss Julia's Gift is a short story that was a special release earlier this year. Ms. Ross provides a little more insight into what makes Miss Julia tick with this story. The reader is allowed to appreciate how Miss Julia thinks and although she is quite happy in her second marriage, she obviously still has issues remaining from her first. Miss Julia's Gift is not so much about the actual giving and receiving gifts as it is a lesson to appreciate the effort that is made and intention behind the gift. Although Miss Julia's Gift was released as a Valentine's Day read, it is perfect for anytime of the year. If you enjoy reading the Miss Julia series, then you definitely want to add this to your to-be-read list. If you haven't read any of the Miss Julia series, what are you waiting for?